If you were tasked to solve an everyday problem in 72 hours with DIY technology, what problem would you solve? As part of the Technology Will Save Us partnership with the British Council, and mobCONTENT, we asked 36 Rio de Janeiro-based designers, engineers, makers, and thinkers just that question. 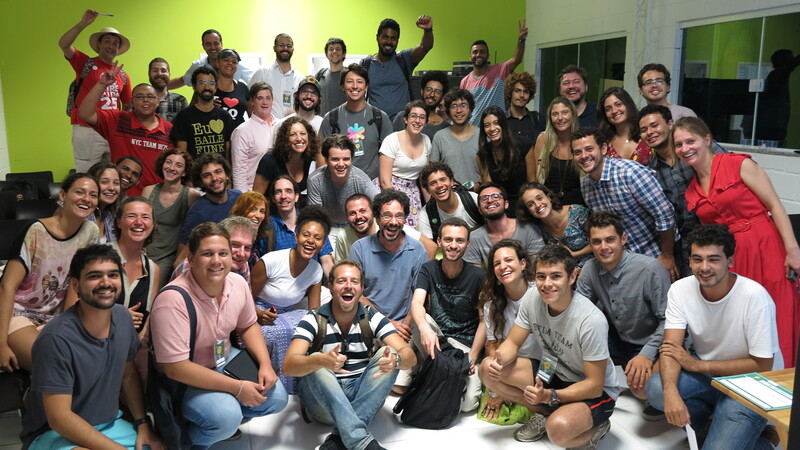 The 36 Rio-based designers, engineers, makers, and thinkers along with our crew. We flew three of our makers to Brazil to host a 72 hour hackathon as part of the British Council’s Culture Shift programme. 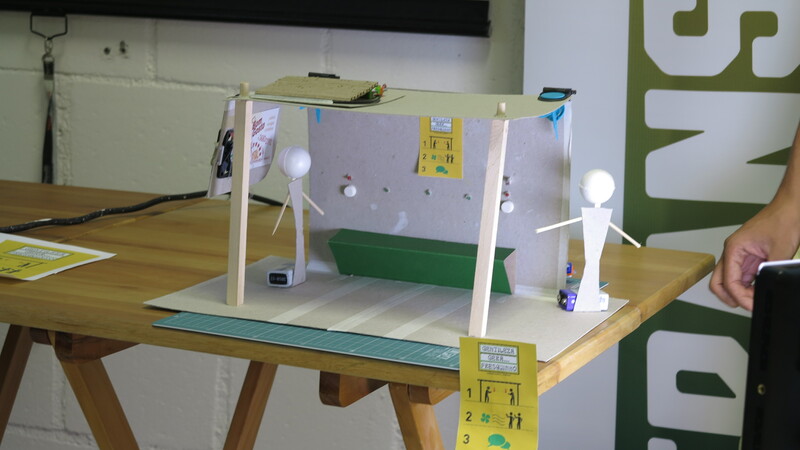 The participants were tasked with coming up with a solution to an everyday problem in Rio using DIY technology. 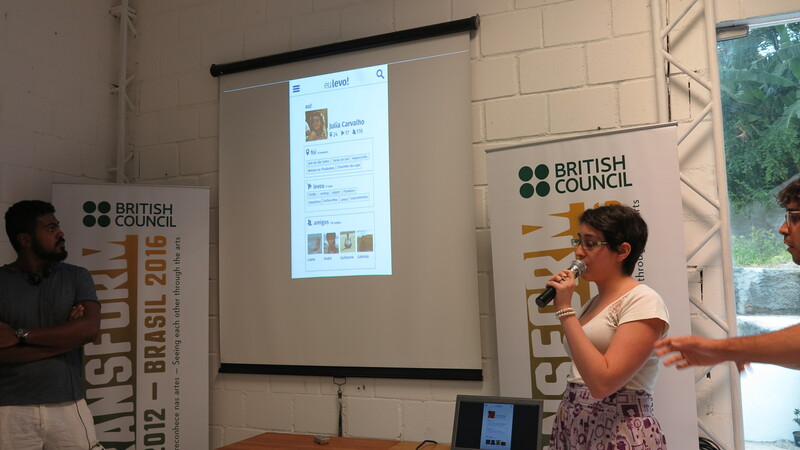 The British Council put up 5,000 BRL (around $2,200) for the winning prototype and group, to help them take their idea further with the aim to get more funding and make it a viable product. All the assembled thirsty plants kits. After an evening of inspirational talks from all the mentors — and running our DIY Thirsty Plant workshop to get the participants making — we set the challenge and let the participants get to it! The second day was a mixture of workshops, firstly introducing them to the wonderful world of Arduino and physical computing, then looking at different prototyping techniques from paper to littleBits — to show how easy it is to turn an idea from pencil to prototype, and how ideas can change and develop when physically manifested. An interactive bus stop — with added fans. One of the most common and largest problems in Rio is transportation, and three of the groups chose to tackle this as their issue. One group developed a prototype for a bus stop that inspires social interaction: two people working together can start a fan to keep them cool. The Bus Stop smart card system. 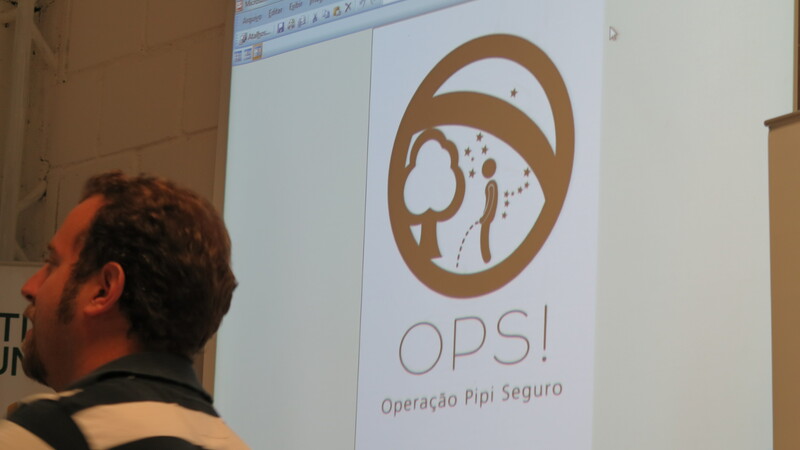 Another group also looked at Rio’s bus network and chose to tackle the problem of unreliable bus services. They created a smart card system — like the Clipper card in the Bay Area, or Oyster card in London — where instead of touching in on the bus, you touch in at the bus stop. This then alerts the bus, and tells it which stops have the most people waiting, allowing the bus to service those with the greatest need first! 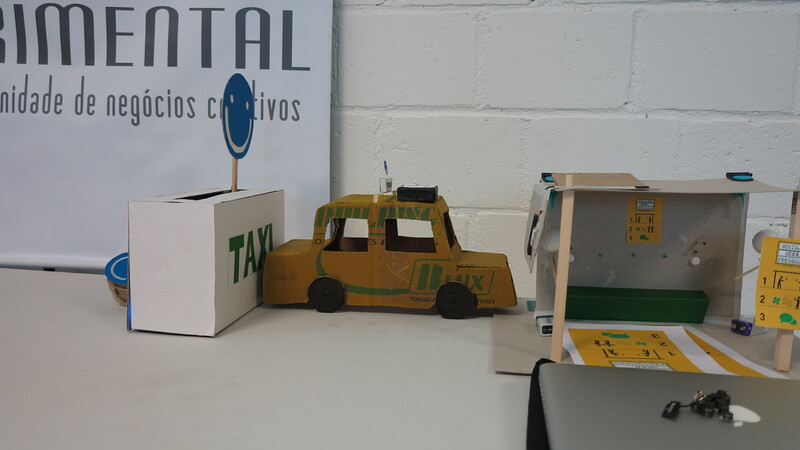 The third transport group tackled the problem of unreliable taxis with a taxi rating system. Currently in Rio, there is no effective way to measure good taxis and bad, meaning that the bad go unchecked. The clever system this group created allows you to rate your taxi experience, after your journey, from your mobile phone. Taxis who have received good ratings display a smiley face to show they provide excellent service! A bracelet that allows you to track your child on the beach. 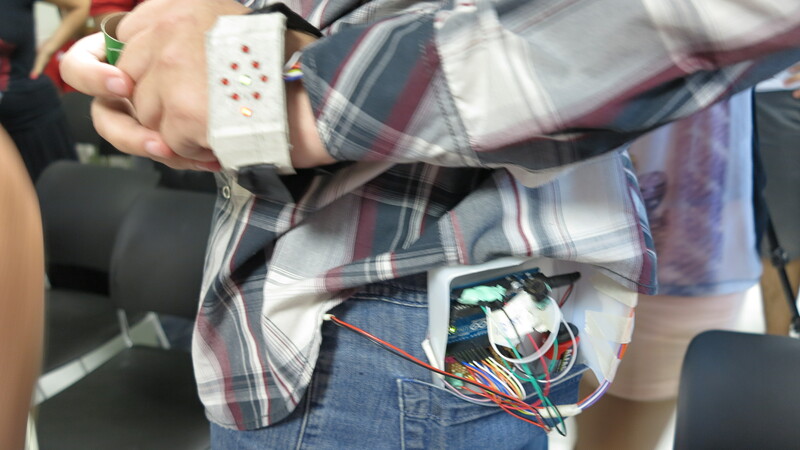 Another group designed a wearable bracelet device that allows you to track how far away your children are on the beach. You simply put one on your wrist and one on your child’s wrist. Find your friends — and drink beer. Finding people was the theme of another group as well. 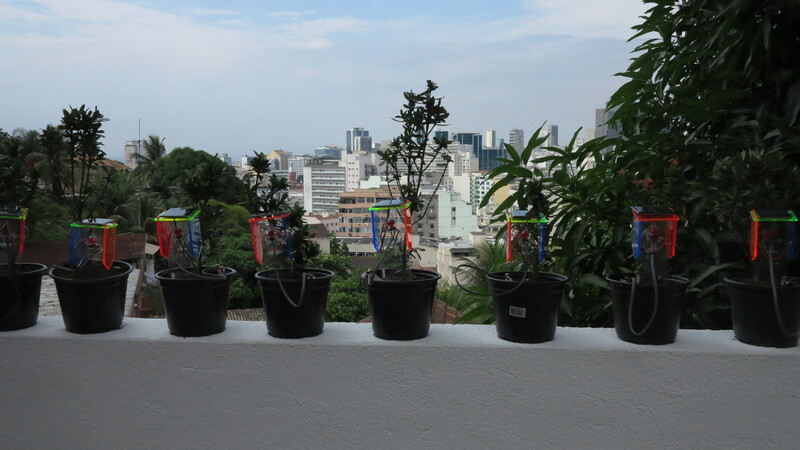 In Rio, people often drink in gardens instead of in expensive bars, meaning it can be hard to find your friends. This group chose to create an app that meets Facebook and Foursquare to tell you where your friends are and what you could bring to the group. All the groups tested their ideas out on focus groups or took to the streets to ask people what they thought of the ideas. This helped them to modify their prototypes for user-centred design. On the last day, the participants presented their final ideas to the judges — which included a spoken presentation and an explanation of their prototype. The judges then had the hard choice of picking the winner! 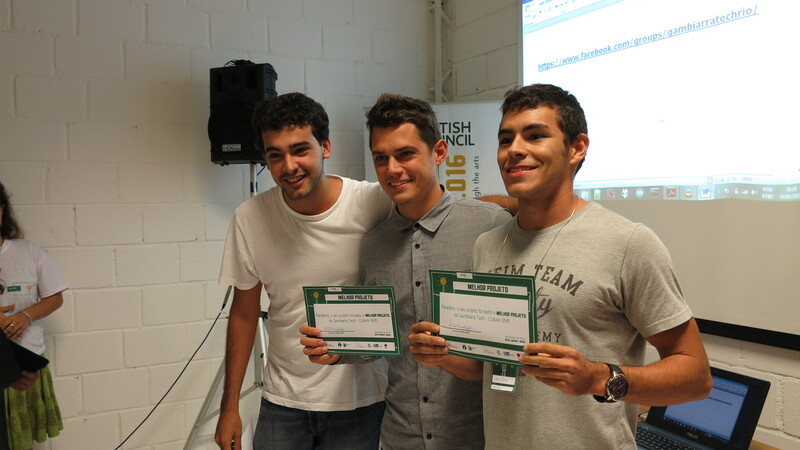 The winners of the Rio hackathon — the Smart Card prototype! The smart card prototype — to let the bus know how many people are waiting at the bus stop — was announced the winner! This group won the 5,000 BRL and now have the opportunity to give their prototype legs and then run with it. We can’t wait to see where it goes! 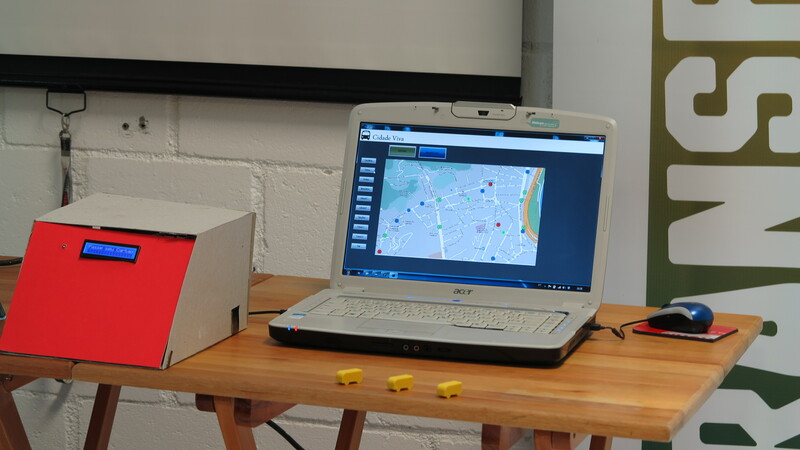 We had a brilliant time in Rio and really enjoyed using our kits to help solve real problems. The problems and solutions that came out of this programme were developed specifically for Rio but what’s great to see is that they have relevance all over the world. We design our kits around everyday life themes such as gardening, gaming, and music, because we believe that people learn more when they are making something they care about. One person’s problem or one everyday need or theme can be relevant to so many different people and the solutions that came out of these 72 hours proved just that. It was exciting for us to see a future for our kits solving real problems as well as centred around things that people love. We always knew DIY technology was the answer, but seeing it in action was amazing! We’re still in touch with the awesome participants and can’t wait to see where their ideas take them!